As the number of devices are expeditiously increasing, so too are the technological convergences they provide. The tendency to use different technological systems (such as voice, data, and video) have become streamlined to interact with each other synergistically. Through this technological advancement of connectivity, we have found that these global, industry agnostic solutions are altering the way our world works, lives, and operates. The Financial Times states, “everything today is becoming more smart,” and righteously so. Daniel Thomas, telecoms correspondent reports this for a FT video from the 2013 Mobile World Conference in Barcelona. As our devices are becoming more seamless, so must our marketing strategies. The way we measure, monitor, and determine the success or failure of our marketing efforts has become a more complicated task than ever before. We are being bombarded with the words, “big data”. It’s hugely active, relevant, and wide spread. According to a study from IBM in 2011, today we create 2.5 quintillion bytes of data. This is so much that 90 percent of the world’s data has been created in the last two years alone. Think on what it must be today, in 2013?! The difficulty we face is how do we analyze these massive quantities of data? David Lewan VP of Sales Operations at ForeSee recently said, “you can’t monitor something you don’t measure,” – and he’s right. We ask ourselves, how are we, Data Driven Marketers, going to break the topic of big data down to manageable, bite size pieces? – Pieces that will point us in the direction to properly gain customer-centric insights that will improve our strategies and the way we do business to ultimately strengthen our businesses for our customers. Some say that the smart integration of data, “requires a multi-pronged approach that aligns technology, company teams, and the various channels, then data to work toward common marketing goals,” (Media Post) and perhaps they are right. But either way, as we are advancing into the future and the data explosion continues to boom, we must become more prepared. 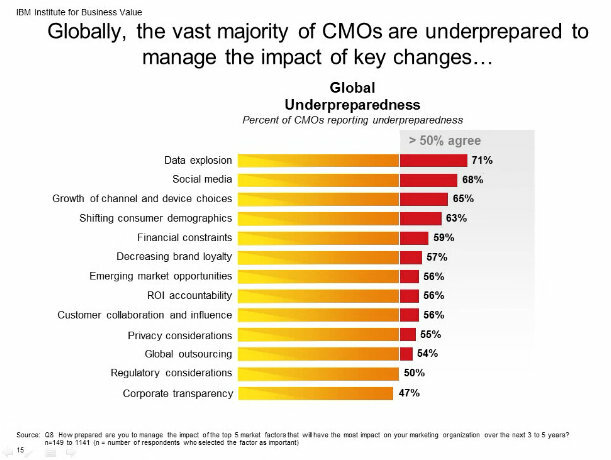 In a study conducted by IBM, when asked, “how prepared they were to manage the impact of the top 5 market factors that will have the most impact on your marketing organization over the next 3-5 years,” more than 1,700 chief marketing officers, spanning 19 industries and 64 countries 71% felt the most underprepared to handle the data explosion. This was the highest concern of all predicted market changes surveyed. Forbes among many other resources are reporting that programs such as SAS make data analytics more useful. As it is, data analysts are needed and are in extremely high demand. One can only predict what will continue to become become in higher demand as our technological capabilities continue to explode. So, for those interactive marketers who have not jumped on board the big data bandwagon, I ask you – what are you waiting for?